Hey, looters here we come back again with a great deal again. Don’t miss out on this great money earning offers from CashKaro where you’ll get Rs.1100 Cashback on Rs.999 when you subscribe for Magzter through us, also get Rs.25 sign-up bonus. You can easily earn Rs.126 and access to 5000+ magazines for free. Now visit here for the Magzter Offer Page at CashKaro Site. You will see the Offer Details. Click on “ACTIVATE CASHBACK” Button and then on next page click on “VISIT RETAILER” Button. You will be taken to Magzter Website where you will see the Magzter Gold Subscription worth Rs.3999 at Rs.999. Just click on Get Started and fill the asked details such as Name, Email, and Password and click on the Subscribe Now button. You will be taken to the Payment Page. Pay Rs.999 through Debit or Credit Card (Don’t worry, you will recover your Rs.999 through CashKaro Website as Cashback which is transferable to Bank account). Once you make the Payment, you are Subscribed for MagzterGold Subscription. Within next few minutes or 1-3 hours, your CashKaro account will be credited with Rs.1100 Cashback for Subscribing Magzter Gold. Now this Cashback will get Confirmed or will be Approved within next10 days after which you can take it to the Bank account. 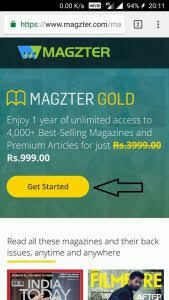 Total Benefit- Magzter Gold Subscription for Free + Rs.126 in your Bank Account! !